‘Breaking News’ – The snow is back. 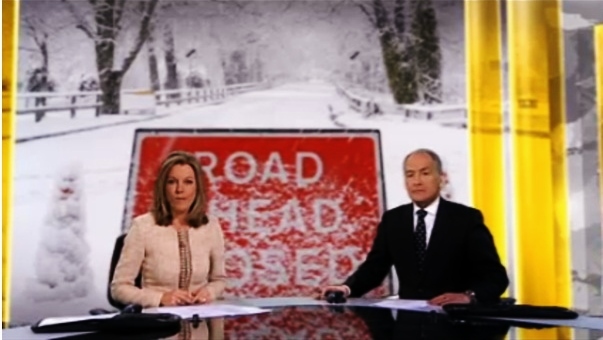 ITV News presenters Mary Nightingale and Alastair Stewart bring us the latest on the snow. British news has once again been dominated by the old trouble maker herself, the weather. Again. But is it really necessary for this same old story about travel disruption, power cuts and how we are coping in the “freezing conditions” to have the worthy of nearly half the air time of an evening news bulletin? I think not. There is a clear argument for the reports on the weather, keeping viewers informed with any disruption to their travels and whether or not their kid’s school is closed. But surely this kind of news can be kept for a short update within a local news bulletin. News of how many schools have been closed in Wales and Northern Ireland is most irrelevant to a viewer in Newcastle. There is an art of recycling when it comes to weather news reports. The standard procedure applies as follows: Top headline about snow; travel disruption because of the snow; how people have been “battling the elements”; a warning from police not to travel; and of course, the question everyone wants to know – is more on the way? I guarantee if you watch a news bulletin on a ‘snow day’ this procedure or near abouts will be the one that dominates. When it comes to reporting on the snowy conditions and “treacherous driving conditions”, there is an element of shock. That shock, however, is that the expense of other motorists. For instance, a common report on the travel disruption begins with scenes of motorways around the country which appear dangerous and un-driveable. But then follows the repeated phrase, “a number of accidents…” which then leads into footage of cars off the road, often in ditches, recognising how very dangerous the roads are. Sometimes there will be dramatic footage from a camera phone showing a car, sometimes a bus, sliding in icy surfaces. Very shocking. But then again, why would any driver be so careless to pass through icy conditions and put their own lives at risk? The ordinary viewer, who hasn’t ventured out because of the cold, voices their opinions within the family – “stupid”, “idiot”, “why didn’t they stay at home” – So whilst the reports do highlight the somewhat incompetence of drivers who ignore previous warnings, they highlight the danger on the roads, underlying the message of the danger in the snow and NOT TO TRAVEL..(unless absolutely 100% vital, of course). Another regular feature which appears on ‘snow day’ news programmes is the art of crossing from the cosy and warm newsroom to the arctic like conditions of the Lake District, Glasgow, Belfast, Buxton, Cornwall and Cardiff (not always used), in the traditional ‘sweep’ around the country to get the wider picture. Mainly so a viewer in the south can comment on how much snow they have had compared to the North. Then follows the ‘Live OB’ – the Outside Broadcast. “Lets cross to Cumbria and get the latest from there…” proclaims the newsreader and then follows one of the single most depressing shots for anyone who wants to be a part of news – one of the country’s brilliant TV journalists, used to battling court room dramas and breaking news, stands freezing, covered in snow and red-faced, in a farmer’s field. There has to be some admiration for these reporters who brave the conditions to bring us the details of what is happening. Although, quite a lot of the time, the closures, conditions and power cuts that are being experienced in Scotland are quite the same to those in Cardiff. It is an endless ‘arctic circle’. At one time, it used to be a novelty to have a news bulletin dedicated to the ‘chaos’ that the snow has brought. Nowadays, with climate change and differences to our weather patterns, snow is bedding down more regular. Where I live, between Liverpool and Manchester, there have been around four different snowfalls in the past six months! Despite that the same reports and information surface – Don’t travel unless necessary; check with your tour operator; stay indoors; check on your neighbours. Compare that to the United States where snow drifts are vast and we look like a country that can’t cope with the white stuff. The news is supposed to be an operation that provides the latest new news. Although each snowfall is new the news that surrounds it is far from that.